Guardian architecture and design critic Oliver Wainwright explains seven highlights from his recently published book Inside North Korea. Wainwright’s book, published by Taschen and released on 22 June 2018, offers a glimpse inside the notoriously secretive nation. 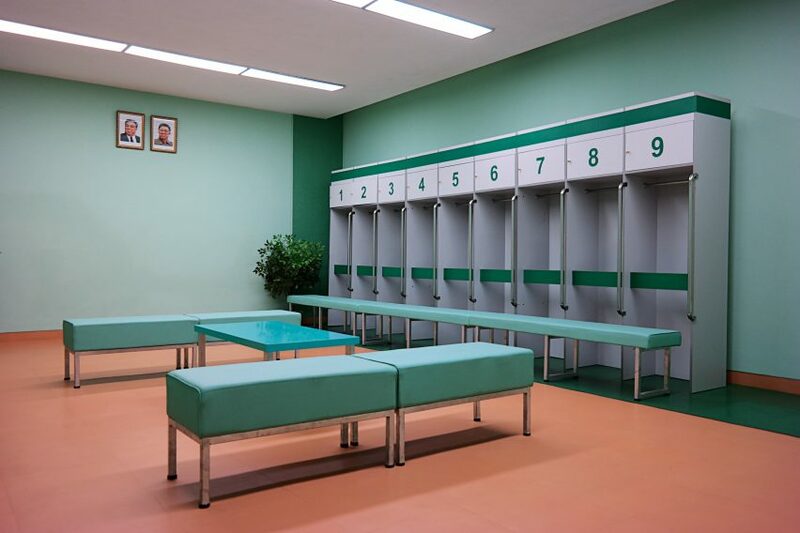 The 200 photos in the book, which are available to purchase, document the strange and colourful architecture of the country and its capital Pyongyang. Completely rebuilt after the end of the Korean War in 1953, the city is the grand vision of the country’s first leader, Kim Il Sung, and contains many intriguing buildings. Below Wainwright explains seven of the most interesting he photographed to Dezeen. 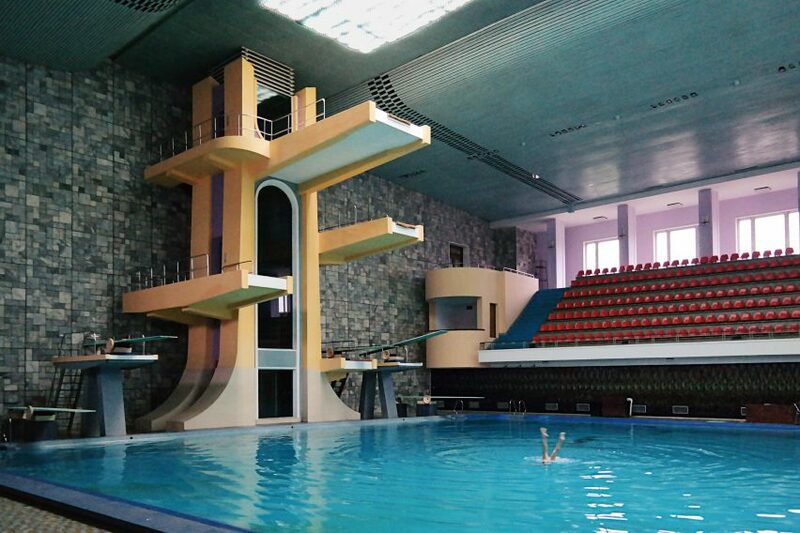 A mechanical elevator shuttles swimmers up to the diving boards behind a smoked glass screen in the Changgwang Health and Recreation Complex, a massive leisure centre built in Pyongyang in 1980. Covering an area of almost 40,000 square metres, with capacity for 16,000 people, it contains a sauna, bathhouse, swimming pools and hair salons – where customers can choose from a range of officially sanctioned haircuts. Attention was lavished on details, from a decorative terrazzo floor in the entrance, to coloured cast glass panels and mosaic floors. 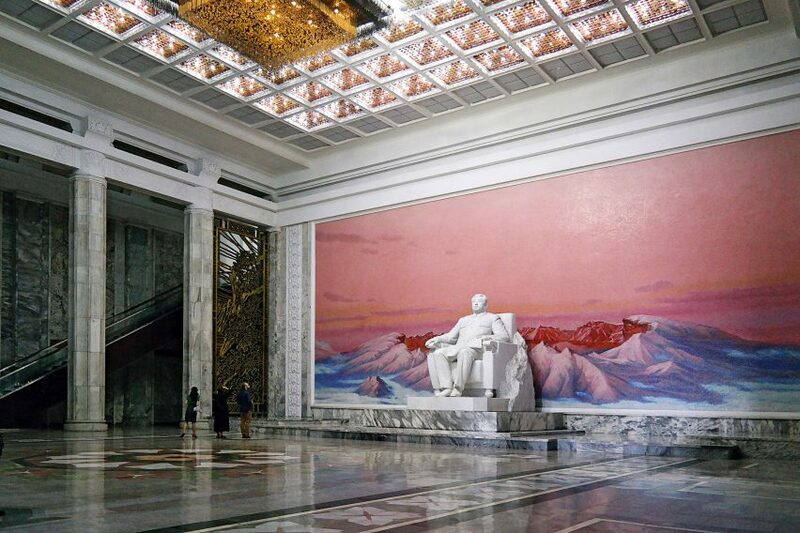 A statue of the country’s founding president, Kim Il Sung, welcomes visitors into the Grand People’s Study House, built in 1982 as the central library of Pyongyang. Planned as the imposing centrepiece of the city, fronting on to the grand Kim Il Sung Square, the building was designed to echo traditional Korean forms, with green-tiled “giwa” rooftops and octagonal stone columns, recalling the pillars of ancient temples. Its 600 rooms have capacity for 30 million books and up to 12,000 visitors a day. The statue sits before a mosaic of Mount Paektu, the sacred volcano where Kim Jong Il is said to have been born. 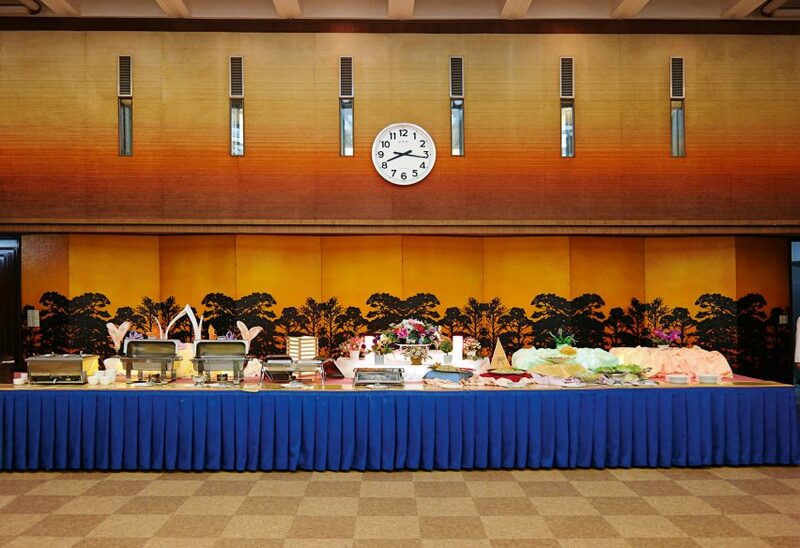 The breakfast room of the Koryo Hotel has the surreal quality of a Wes Anderson film set, with a complementary colour palette of orange and blue providing a backdrop for vases of plastic flowers and plates of kimchi and boiled eggs. Built in 1985, the Koryo Hotel is the premium hotel for foreign visitors, standing as a pair of 45-storey towers connected by a bridge and crowned with a revolving restaurant. With a total of 500 rooms, the hotel also has a bookshop, movie room, banquet and conference rooms, as well as a casino and “wading pool” in the basement. 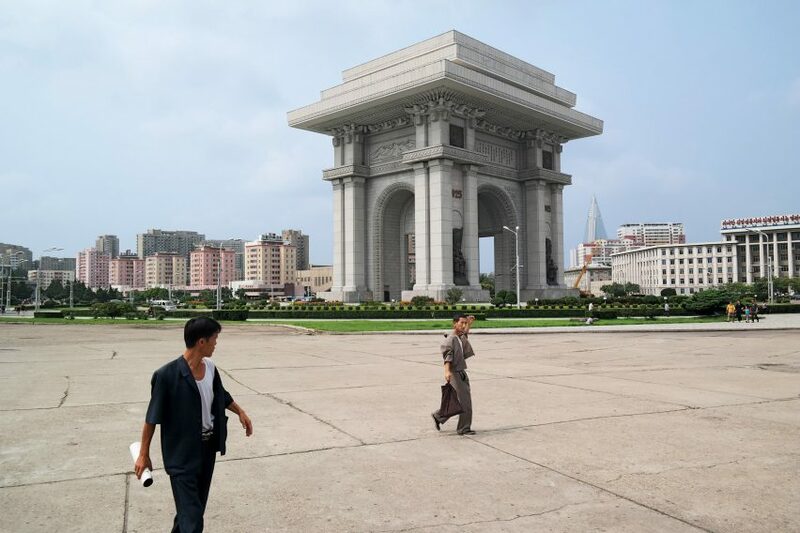 Built in 1982 to celebrate the 70th birthday of Kim Il Sung, the Arch of Triumph is apparently clad with 25,550 slabs of stone, marking the number of days of the leader’s life at that point. Modelled on the Arc de Triomphe in Paris – except 10 metres taller than its namesake, with the addition of a triple-decker stack of oversized rooftops – it was built on the site where Kim Il Sung entered the city in 1945 to be greeted by cheering Koreans, marking the end of the Japanese occupation and the beginning of socialism. 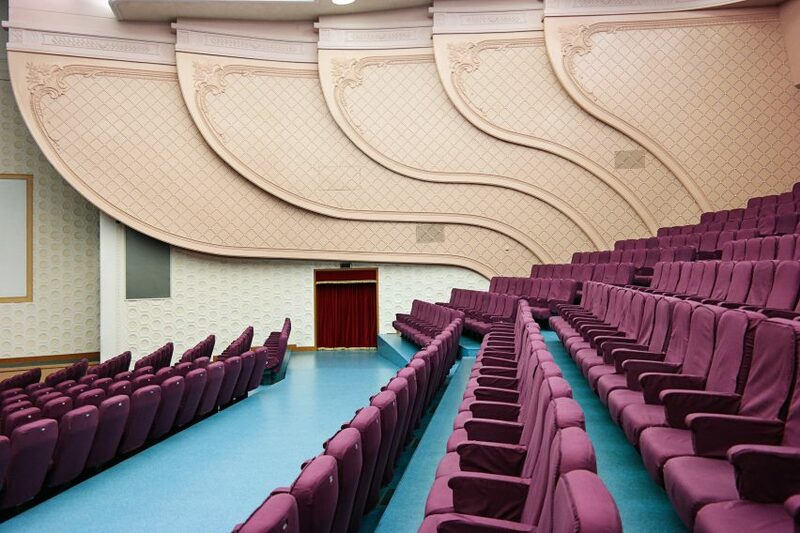 One of three major theatres in the capital, the East Pyongyang Grand Theatre was built in 1989 as an interlocking composition of two buildings, one semicircular, one rectangular, containing a 3,500-seat auditorium along with dozens of rehearsal rooms. A renovation in 2007 saw the lobby fitted with plaster mouldings, highly polished stone tiles and a huge relief mural on the wall, while the theatre was decorated with scalloped peach-coloured walls, purple-upholstered seats and a bright-blue vinyl floor, in-keeping with the predominant aesthetic of complementary colour schemes. Built for the 1989 World Festival of Youth and Students (a kind of communist Olympic Games), the May Day Stadium was designed to resemble the unfurling petals of a magnolia flower, or a parachute that has just settled on the ground. It is said to be the largest stadium in the world, with capacity for 114,000 people. It was used for the Mass Games gymnastic performances for years, and reopened in 2015 after a two-year renovation, which saw a new football pitch and running track installed, along with ancillary rooms for training and press conferences – together with the optimistic addition of the FIFA and Olympic logos. 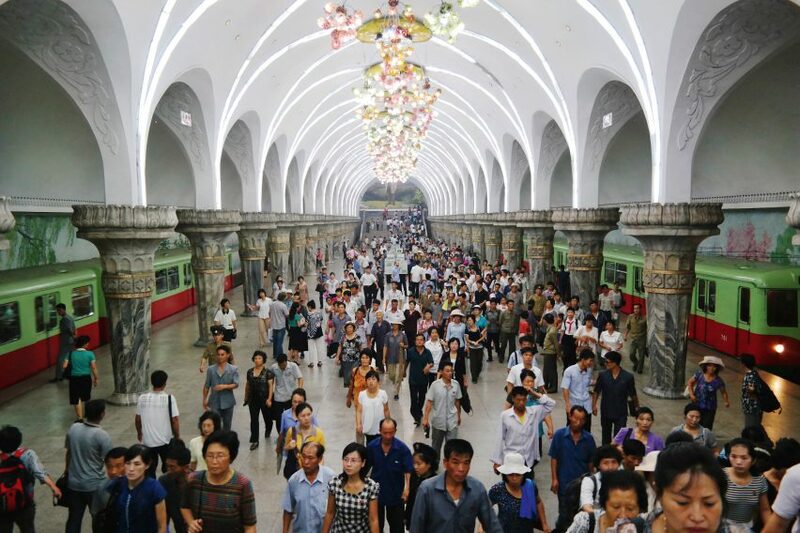 Claimed to be the deepest subway system in the world, at 110 metres below ground, the Pyongyang metro shares the same palatial scale and lavish decoration as the Moscow metro, with platforms adorned with marble columns and crystal chandeliers. The stations’ great depth also means they can double up as bomb-shelters, a secondary function revealed by the thick steel blast-doors. There are two lines – the Chollima and Hyoksin – with eight stations each, with names like Comrade, Triumph, Victory and Reunification. Gilded statues of Kim Il Sung greet commuters, along with exquisitely detailed socialist-realist mosaic murals and sculpted reliefs depicting patriotic scenes. @2018 - Turret. All Right Reserved.